This 4 day, 3 night combo package is an amazing opportunity to see two of Australia's top destinations. A sailing tour of the Whitsundays combined with a tag-along tour to Fraser Island are sure to show you the time of your life! 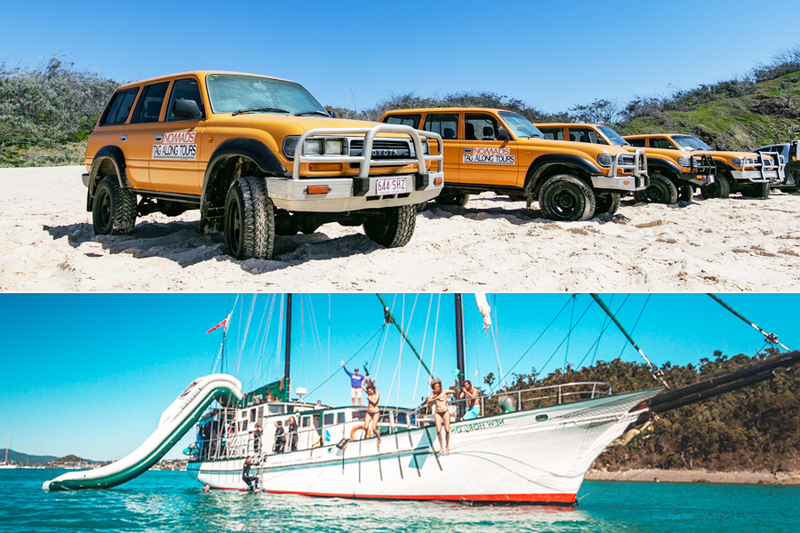 You will get to spend 2 days and 2 nights on board the fun and lively sailing boat, New Horizon, and 2 days, 1 night on Fraser Island with Nomads for an unforgettable 4 days and 3 night of adventure. Both tours boast shared accommodation, making this a social tour that is ideal for meeting new people and like-minded travellers. New Horizon is a tour of the Whitsundays that is full of fun and adventure! Besides covering all of the top spots of that the islands have to offer, including the fringing reefs, Whitehaven Beach and Hill Inlet Lookout, this fun tour also has a diving board, waterslide, paddleboards, and an onboard movie room! During your time on New Horizon you can expect to be faced with fun, adventure and exploration with all the extra bonuses. Enjoy an authentic sailing experience while in the stunning Whitsundays on board one of the most fun sailing boats around! This 2 day tour will keep you busy while also giving you time to relax, without breaking the bank. New Horizon is one of the few boats in the Whitsundays that offers scuba diving, making it a must-do if you want to spend some time below the waves! Nomads 2 day, 1 night tour of Fraser Island gives you the chance to see Fraser Island at its best, even if you're short on time! The 2 full days and 1 night on the island will give you the opportunity to see some of the best parts of Fraser Island in a tag-along tour. With a tag-along tour, you will have the opportunity to drive on Fraser Island, which is a unique experience on its own! But added to this is a visit to Lake McKenzie, Lake Wabby, Maheno Shipwreck and other Fraser Island icons. You will spend your night on Eurong Resort in a dorm-style room that will have everything you need for a comfortable nights sleep. For 2 amazing days, you will get to explore some of the best parts of Fraser Island. This tour is all inclusive where everything will be taken care of for you! If you're short on time, or if you just wish to spend 1 night on the island, this package is the one for you. This package only runs from Dec 1 - April 30 annually and is suited for 18-35-year-olds.